A miniature rainforest in artisan glass. This self-sustaining ecosystem brings the calming beauty of nature into your home or workplace. And you don’t need to be “good with plants.” All you have to do is enjoy watching it thrive. Our awe-inspiring shop is right at the corner of 44th & Hawthorne in the hippest part of Portland, Oregon. Take a virtual tour of our shop here. Experience an unforgettable, creative evening planting your own terrarium in our popular terrarium class. Make a memory (and a terrarium) together. 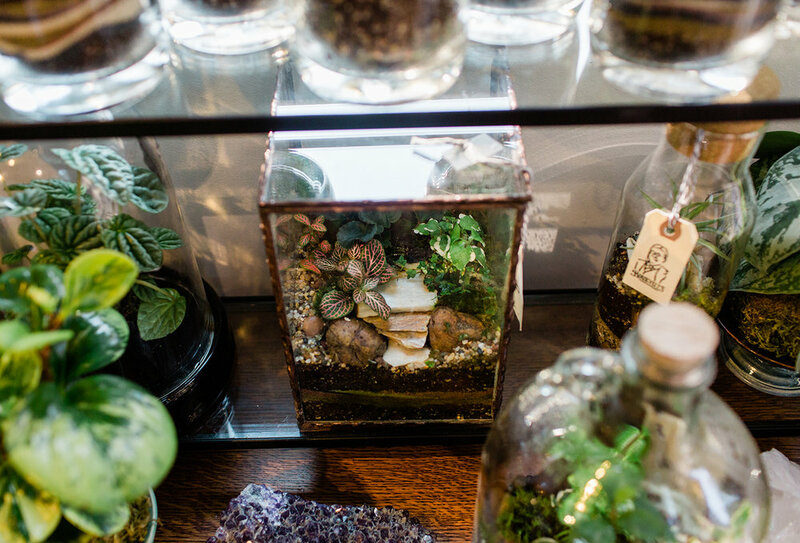 Come share the one-of-a-kind experience of creating your own terrarium. We’ve served over 3,000 students in the most popular terrarium class in the U.S. Just bring your creativity (and maybe a bottle of your favorite beverage)—and we’ll provide everything else as we guide you step-by-step. That’s right. We will repair or replace any terrarium planting that fails to thrive, and, we will trim and clean your terrarium for you as often as you like, just for tips. You really can’t fail with our terrariums, because we won’t let you fail. All you have to do is enjoy it. Details. Hello, My name is Gregg Harris and I am the proprietor of Roosevelt’s Terrariums. As a young hippie I planted my first terrarium nearly 50 years ago. I learned to carefully fold the plants and ease them through the narrow openings of cider jugs and carboys. Then I would nudge the plants into place to create a small garden under glass. I am still amazed at how they became even more beautiful over time. Terrariums have shown me what an incredibly overwhelming force life is. They have also taught me how to “do well by doing good” in relationship to others. I opened my little terrarium shop here on 44th & Hawthorne just over four years ago. Now, as an old hippie, I’m still creating miniature rain forests in artisan glass. And that has proven to be a pretty good fit for a weird and wonderful city like Portland, Oregon. I named my store after Theodore Roosevelt for two reasons. First, because he was a great conservationist President who was actually into terrariums as a young man. The second reason is because I am a Roosevelt Impersonator. I go out into our local schools in character as Theodore Roosevelt for educational presentations. That is also why I have decorated my store in the Arts & Crafts style of the Roosevelt era with lots of Mission Oak furniture. People describe our shop as awe inspiring. It’s filled with tropical plants, live mosses, cute little poison dart frogs (which, by the way, are not at all poisonous), beautiful rocks, minerals, fossils, crystals, taxidermy, and of course, gorgeous glass terrarium containers of every shape and size. It’s a wonderful place for anyone who appreciates the wonders of this big terrarium we live in called Planet Earth. I hope to see you here soon.